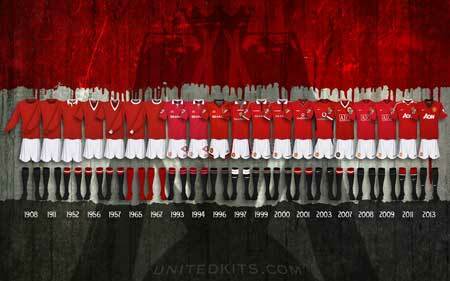 Each season since United's formation in 1878 has its own page with illustrations of all the kits worn that year both by the outfield players and the goalkeepers. We have listed the kits worn in individual games and in pre-season from 1971/72 onwards. There are, unfortunately, several games in which we have yet to be able to identify United's kit. The list of missing kits can be viewed or downloaded. 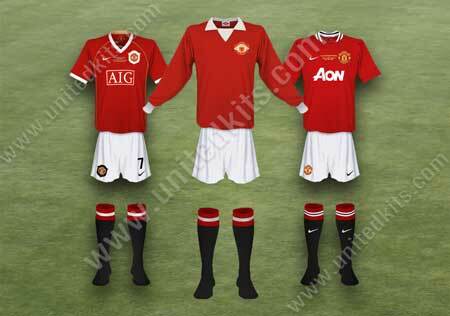 The kits worn in post-war testimonial games at Old Trafford. The kits are grouped together in periods rather than by season. We have also included a comprehensive history of the club badge with images taken from player issued shirts. Free desktop wallpapers designed by Tim Ashmore. A list of those people who generously donated to our appeal can be found on our donations page. Your donations are greatly appreciated by us all at unitedkits - many many thanks. Sean Moran has identified a new variant of the Admiral change kit worn in the pre-season friendly against Red Star in August 1976. We have added this kit and also some fascinating information discovered by Daniel on the launch of the change and third replica kits in 2003/04. Thanks to Sean Moran we have added several kits worn in friendly matches during 1978/79, 1982/83 and 1983/84. The missing kits list has been updated. Daniel also spotted Mason Greenwood wearing a variant third change shirt at PSG on Wednesday, which has also been added. We have now moved servers and all pages on the site should be available to view. If you experience any broken links or missing pages please conact us. We have raised the £200 we needed to cover the costs of hosting this site for the next three years. Many, many thanks to all those who donated so generously and who have helped keep unitedkits.com on line. We have launched an appeal to raise £200 to cover the costs of hosting this site for the next three years. Please donate if you are able and help keep unitedkits.com on line. Daniel has researched the wearing of tracksuit bottoms by Peter Scmeichel & Raimond van der Gouw in 1996/97. Five new images have been added to that season's kit page. We have amended the black and white hooped shirts worn as a change/third kit between 1936-1945 after Charbel Boujaude sent us a match report from the Reserves game against Burnley in December 1937. The shirt worn in that game was described as black and gray hoops, although it may be that the dye had run. The Admiral kits 1975-1980 and the first seasons of the adidas kits (1980-1982) have all been updated after Daniel's extensive research into this period. The shirt backs have also been updated. 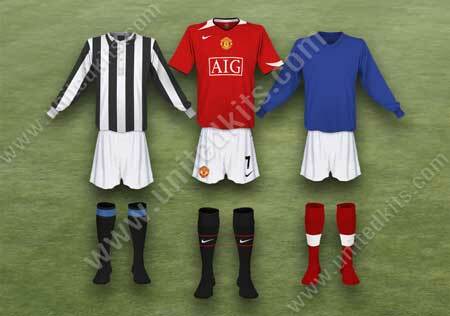 We have also updated this season's Champions' League kits with information supplied by Denis Hurley. We have uploaded all of the new kits for 2018/19 including the shirt backs. This season's nominted player is Academy graduate Jesse Lingard. The 2018/19 season has been updated with the new outfield home and third kits and all three goalkeeper kits. We will be adding the shirt backs shortly. All of the pre-season kits are also included. Andrew Shortman has sent us the following link to a fascinating British Movietone film of United's visit to West Ham in the FA Cup on February 25th 1911. Footage from United's game at Burnley on December 6th 1902 can be seen in this YouTube clip. Please note that unitedkits NEVER endorse the authenticity of United shirts being sold on eBay or similiar websites. If a seller is referencing this site in an advert, it is being done without or knowledge or approval. Read the previous news updates in our archive. 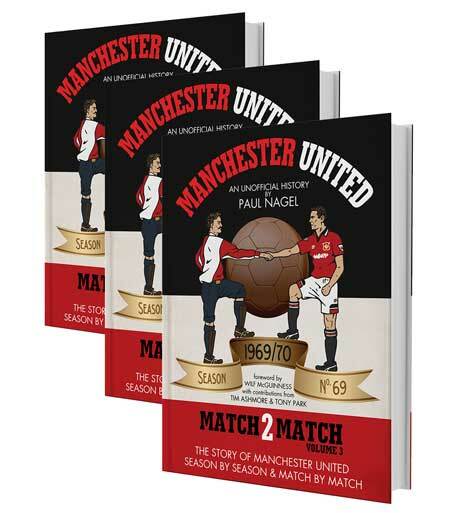 Paul Nagel is the author of a series of books on United's history. Each book covers a single season with first team results, match reports, player profiles. There are also weekly league tables as well as the results from other games and details of the Reserve and Junior team matches. We rely on contributions to maintain the accuracy of the site. If you have discovered a kit that we do not feature on the site, or believe we may have made a mistake, please contact us and if possible attach a photograph of the kit. Follow us on several social media sites. Click on the links below.